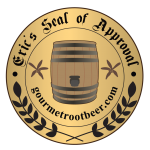 More than any other root beer, Hank’s is the reason that Eric’s Gourmet Root Beer Site exists. You see, the web was young and free hosting was just recently made available at places like Geocities. It was the cool thing to do to make a website. After seriously considering making a website about a combination of three of my favorite things, cheese, Jethro Tull, and Star Craft, (The Eric’s Cheese, Jethro Tull, and Star Craft Site was going to be AWESOME I swear) the idea came to make one about gourmet root beer instead. Since I’d only tried eight different kinds of gourmet root beer (there wasn’t a lot of variety in a town of 5,000 people) at that point I figured I needed to expand a bit. I found Hank’s online and asked my Mom to order it for me. I had a whole $15. She called and they said that they’d never sent anything to Washington State before and they figured it’d be very expensive. She said she’d have to call back because she was buying it for her son who was making a website but he didn’t have much money. Then they decided that since it was for a website, and thus free publicity, they’d send a whole case as a free sample. How very generous. Also, it put a lot of expectation on me to actually follow through and make the website since I was paid in advance as it were. And thus Eric’s Gourmet Root Beer Site was born. This is sooo goooood! It has a wonderfully full Body that is rich and creamy and a nice spicy Bite. The Head is almost perfect. Aftertaste is very pleasant. As you can tell, I really liked it then (I’ve kept what I originally wrote back in 1998). It put me in quite an enigma because at the time it was the best brew I’d ever had, but I hadn’t had very many. I put it at 4.5 kegs and after many years I revisited it in my Ultimate Root Beer Showdown and realized that after nearly 150 root beers, it was still the best. I really love this stuff. It is perhaps as close to perfection as we can come in this imperfect world. See how it rates against other root beers.